Throughout the month of August, we are opening the doors and welcoming the community to lend a voice in selecting sessions for SXSW EDU by participating in PanelPicker voting through Thursday, August 30. Last month during the submission stage, nearly 1,500 proposals were submitted for SXSW EDU via PanelPicker, our digital crowdsourced platform. Voters have the option to filter proposals by track, format, tags, or search for specific terms, speakers, and companies. We recommend voters filter by format – or take a second to take note of the format identified on each session they review – as it heavily influences the intention of the proposal. The format selected will indicate the level of audience participation, and even the way that the room is set up. For example, workshops and hands on sessions are assembled in roundtables and are very interactive whereas panels might be better described as a presentation-based, theatre-style setting. Here’s a quick guide to voting by format as well as some stats about this year’s proposals. Panels consistently make up the largest percentage of PanelPicker entries and with 400+ panel proposals, this year was no exception. Panels can have 2-4 speakers and as a result, offer a diverse array of viewpoints around a particular topic. In-depth and interactive programming is extremely popular at SXSW EDU because attendees are largely interested in instructional, active learning opportunities. 19% of this year’s PanelPicker proposals were workshops and another 3% were hands on sessions. The biggest difference between the two is that while workshops are deeper dive two-hour sessions, hands on sessions are shorter-form activities presented in 30 minutes. A few debates, which have returned for SXSW EDU 2019 after not being included in PanelPicker the past few years, were submitted for consideration. Interestingly, the debates submitted primarily fall in the K-12 and Higher Education tracks. Meet ups are speaker-facilitated networking events that encourage communities to connect around similar topics, passions, roles, or interests. Despite the fact that meet ups only accounted for 3% of PanelPicker entries, most tracks are represented in the proposed ideas. Of the remaining formats, Future20s accounted for 8% of PanelPicker submissions and talks 19%</strong,> while campfires rang in at 7% and case studies at 11%. Participating in the voting process is simple. To get started, go to visit panelpicker.sxsw.com/vote and sign in or create a free account. After you have signed in to PanelPicker, you can start voting on sessions. Select “SXSW EDU 2019” from the conference dropdown and filter by session format, programming track, and level. You can additionally search by title, tags, and speakers, using the search field. Only one vote can be cast by each user per each proposal by selecting “arrow up” for yes or “arrow down” for no. You can also leave a constructive comment about the proposals you vote on. 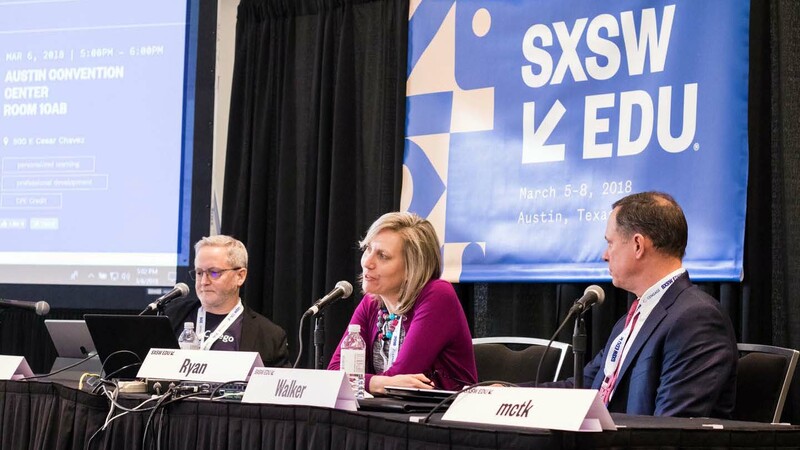 Mission Critical: Train Like the Army panel at SXSW EDU 2018 featuring Andrew Smith Lewis, Diane Ryan, and Keith Walker. Photo by Maryln Garcia.